There was an odd article in the Telegraph last week. Odd because the headline, photograph and content didn’t quite cohere. Andrew Gilligan has apparently got hold of a leaked government document which seems to suggest that the Home Office is planning a ‘National Register of Faith Leaders’. But the headline says: ‘Imams will have to register and face security vetting under Home Office plans‘, and the featured photograph is of a line of Rabbis. Would it have been too inflammatory to have shown a mosque or a line of imams? 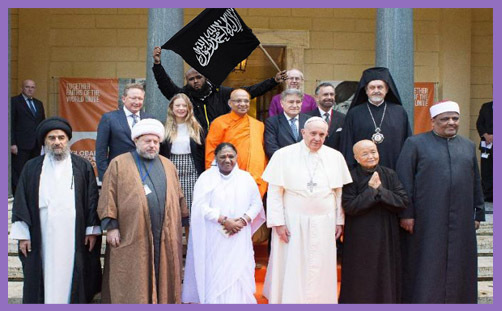 Would it have been too tranquilising to have published a picture of a multifaith mishmash of religious leaders, just to make it evident that hundreds of gentle Quakers and thousands of placid priests will be caught by this regulation as well as a couple of hate-breathing and liberty-loathing imams? He’s not wrong there. But the resistance is far more likely to be one of theo-political confusion and clerical definition rather than political defiance, for in order to create a National Register of Faith Leaders, the Government is going to have to define both ‘faith’ and ‘leader’. This may be a matter of elementary observation for those religions which are manifestly concerned with worshipping a deity and are subject to a hierarchy of spiritual authority, but what of Quakers, each of whom has parity of honour and agency in the egalitarian priesthood of believers? They have no ordained clergy and no chain of command: how are their leaders to be vetted when they have none? And what of Buddhists, who have neither god nor leader? Is it a religious faith or a philosophy of life? How, precisely, is the Home Office going to screen all faith leaders when faith is nebulous and leadership so variously apprehended and understood? Will all Baptist youth workers be required to register? Will Methodist mums who lead coffee mornings be required to register? Will peripatetic prophets who preach judgment and salvation across the nation? We are informed: “The Government needs to concentrate on ensuring that safeguards are in place to protect the public and treating all faith communities equally”. Ay, there’s the rub. The Home Office can’t monitor extremist mosques or audit radical imams alone, for to do so would be discriminatory, not to say ‘bigoted’ and ‘islamophobic’. So those pesky Quakers will have to be watched carefully, too, just in case they’re plotting to assassinate the Queen. And those jihadi-sympathising Jews will also need to register, just like they did in.. It beggars belief that this Government – a Conservative government – is planning to introduce the most draconian assault on religious liberty since the Test Acts. Just because a few extremist preachers of Islam and myrmidons of Mohammed want to debase our daughters, corrupt our democracy, cut our throats or blow us up, we are all now al-Qaeda. Apparently, this strategy was supposed to have been published in the spring, but has been delayed “amid deep concern in some parts of government and most of the counter-extremism community about its most radical measure, to ban individuals whose behaviour ‘falls below the thresholds in counter-terrorism legislation’ but which ‘undermines British values'”. And so we return to David Cameron’s quest for a creed of moral conformity: “For far too long, we have been a passively tolerant society, saying to our citizens that as long as you obey the law, we will leave you alone,” he warned. “This Government will conclusively turn the page on this failed approach.” So, if you don’t accord with the new state orthodoxy, you are a threat to the British way of life. If you don’t believe in David Cameron’s definition of British values, you are an extremist. Does the Prime Minister not understand that he is doing precisely what the Islamists want? Doesn’t he grasp that they seek to eradicate our freedom – including the freedom the critique Islam or denounce Mohammed – and that a National Register of Faith Leaders will only license those who agree to “respect” different faiths and “support” the British way of life, as defined by the government of the day? Doesn’t he know that this Register is the foundation of religious totalitarianism, and will inevitably lead to the arrest of more Evangelical street preachers than odious Islamist radicals? ‘Non-violent extremism’ is a sound and long-established mode of doing Christian mission: indeed, Christians are called to be non-violent extremists. One expects illiberal authoritarianism to flow from coercive apprehensions of socialism: one does not expect it from a Conservative prime minister. If it is “not acceptable” to David Cameron or Theresa May that child grooming in Rotherham or the ‘Trojan Horse’ affair in Birmingham were hindered by “a poor understanding of isolated communities”, it is even more unacceptable to law-abiding people of faith that all religious communities will henceforth worship under the suspicion of “extremist behaviour”. If the fight against the “poison” of “Islamist extremism” is “the struggle of our generation”, then the fight against our servitude to totalitarian values will become the struggle of all peaceful and faithful communities the length and breadth of the country. It is not for the Government to approve religious leadership, and it is not for the Prime Minister to determine the precepts of true religion. Compassionate Conservatism and Social Justice – bedfellows or bugbears?